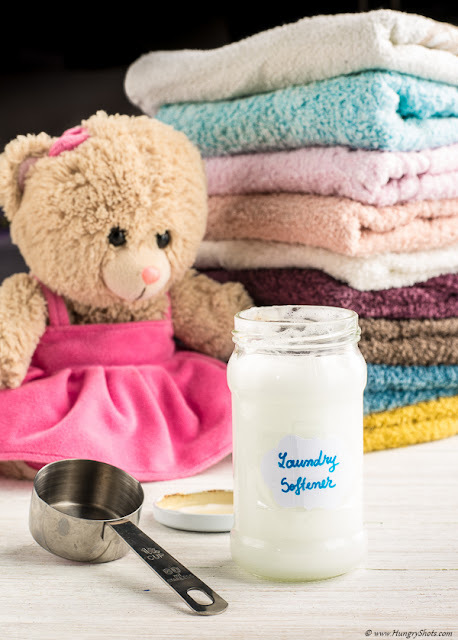 When I was pregnant with my second child, one of the smells I couldn't stand was the one of the freshly washed clothes with a well known fabric softener. In fact I couldn't stand any artificial strong smell. That made me thought of changing some habits. To solve the problem back then, I simply gave up using a fabric softener. After that period has passed I restarted to use it but not for long. I have in mind a totally natural fabric softener and I'll do it one day. Till then I tried another simple recipe. The thing that convinced me started with a laundry accident. Without noticing I washed a brown wool pull of my husband at 60ºC. Imagine that later he wanted to wear it and ... surprise... the sleeves were to short, the pool was also too short and too narrow. Thinking that I managed to ruin it completely I started to wear it myself. In the meantime I found out about a trick to stretch back a wool pull with hair conditioner. It was hardly to believe it but I didn't have anything to loose so I tried it. I put the pull in cold water with hair conditioner and let it there for 30 minutes. Then I rinsed it gently and stretched it slowly on a flat surface. Unbelievably it came back to its shape after 3 days slowlydrying at room temperature. If you think a bit, it makes sense, as wool comes from an animal and normal laundry detergents are not made for washing hair. What this story had to do with the homemade fabric softener? Well, that made me thought that ahair conditioner might work as a laundry softener so I tried it. Take a bowl of at least 2l and pour the hot water. Add the hair conditioner and mix well with a blender. A hand whisk should be fine as well. Add the vinegar and mix. It will foam a bit and this is totally normal. Pour this softener in a closed recipient and give it a bit of shake before usage. Use 50ml or 2-3 tablespoons with each load.